Fully Automatic Printing Head,Flat Bed Screen Printing Machine,Fully Automatic Printing Head - Printing Heads Manufacturer,Supplier & Exporter in Ahmedabad,India. The printing head assembly is one of the core assemblies of the machine, it is designed and manufactured to give quality printing results. 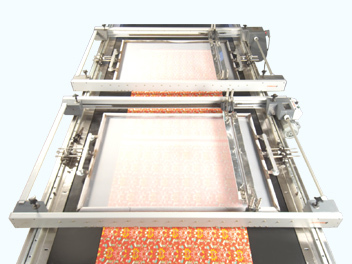 The printing parameters are entered through a centralized panel for each head. Each Printing Head Assembly is designed as independent modular system. Each printing head can be repeat set quickly without any auxiliary equipment. Motion is transmitted to the squeeze through timing belts avoiding gear boxes resulting in smooth and noiseless operation. The squeezes are adjustable to give even printing pressure on the screen. All moving parts are engineered to provide optimum life and efficiency.